GWT PopupPanel can be optionally displayed with a "glass" element behind it, which is commonly used to gray out the widgets behind it. It can be enabled using setGlassEnabled(boolean). It has a default style name of "gwt-PopupPanelGlass", which can be changed using setGlassStyleName(String). Let's see the declaration of com.google.gwt.user.client.ui.PopupPanel class. PopupPanel.AnimationType It is the type of animation to use when opening the popup. PopupPanel.PositionCallback It is a callback that is used to set the position of a PopupPanel right before it is shown. PopupPanel.ResizeAnimation It is used to enlarge the popup into view. PopupPanel() It creates an empty popup panel. 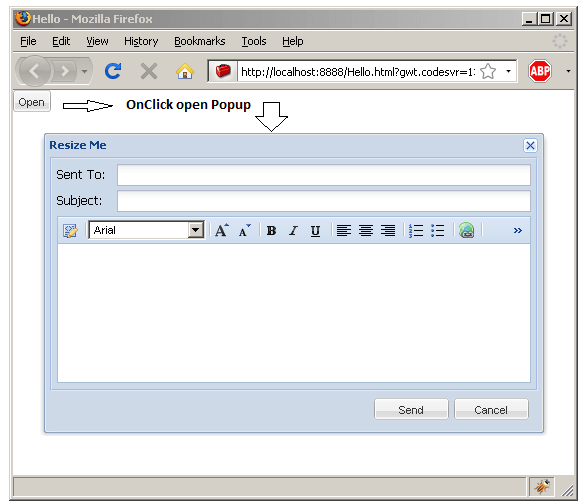 PopupPanel(boolean autoHide) It creates an empty popup panel, specifying its "auto-hide" property. PopupPanel(boolean autoHide, boolean modal) It creates an empty popup panel, specifying its "auto-hide" and "modal" properties. void addAutoHidePartner(Element partner) It is a mouse events that occur within an autoHide partner will not hide a panel set to autoHide. void center() It centers the popup in the browser window and shows it. PopupPanel.AnimationType getAnimationType() It get the type of animation to use when opening and closing the popup. int getOffsetHeight() It gets the panel's offset height in pixels. int getOffsetWidth() It gets the panel's offset width in pixels. void hide() It hides the popup and detaches it from the page. boolean isAnimationEnabled() It returns true if animations are enabled, false if not. boolean isModal() It returns true if keyboard or mouse events that do not target the PopupPanel or its children should be ignored. boolean isPreviewingAllNativeEvents() It returns true if the popup should preview all native events, even if the event has already been consumed by another popup. void setModal(boolean modal) When the popup is modal, keyboard or mouse events that do not target the PopupPanel or its children will be ignored. void setAnimationType(PopupPanel.AnimationType type) It set the type of animation to use when opening and closing the popup.